I’m not that good at identifying wild flowers. Botany is definitely a subject I could do better in. But then by most people’s standards I’m not exactly a dullard either. I can put a name to most of the common stuff, it’s just there’s still quite a bit that’s a mystery. One wild flower I can identify is the Harebell Campanula rotundifolia. A couple of Sunday’s ago I went looking for the Adonis Blue butterfly at Martin Down but pretty much as soon as I arrived it absolutely lashed it down. While I waited for the insects to towel themselves dry I got distracted by these delicate little violet-blue flowers. The water droplets and soft light adding to their attractiveness. Generally I focus on taking reference shots rather than photos for their artistic merit. But as I had my waterproofs on and time to kill I took a few photographs lying down on the wet ground and experimented with the depth of field. I quite like the increasingly blurry background but can’t help thinking how I’d like to see a pristine water-droplet coated Adonis Blue perched on the right-hand side of the nearest flower. These pretty little flowers are known as Bluebells in Scotland and were once used in the manufacture of the blue dye used in tartan. Incidentally the name Harebell is a reference to the fact that these bell-like flowers can often be found where you find hares. Both are fond of dry, open grassland. On a similar theme witches are thought to be able to transform themselves into hares by drinking the milky sap. 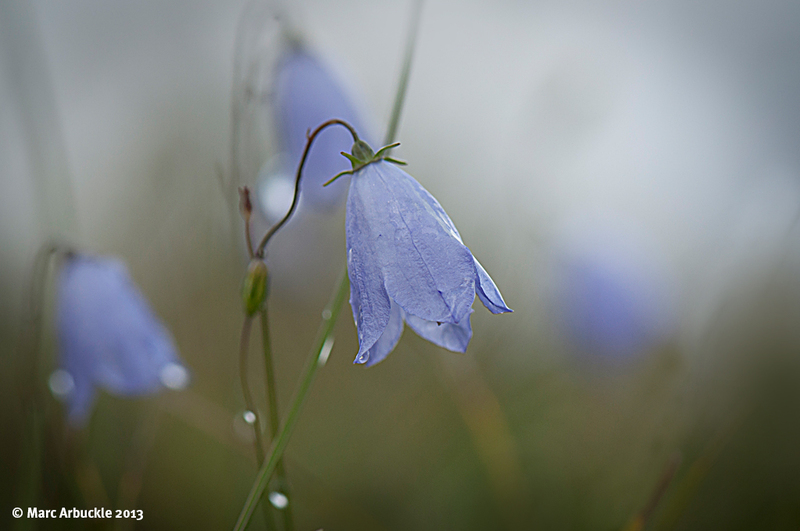 North American Indians call them ‘blue rain flowers’ as they believe picking them will cause it to rain. Well, it wasn’t me. Wow! One of my faves you’ve done. Thanks Lisa, always good to hear from you. Do you get these flowers in Oz?